I arrived back at the airfield bright and early at 8:30am this morning. The plan for today was for me to do some more solo time in the training area. I taxiied to 36 and did the pre-takeoff checks. An aircraft was on final for 36L so I crossed 36R and made a call that I was holding short 36L. Interestingly, I think that I’m becoming (at least slightly) more comfortable with doing non-standard radio calls (i.e. adding stuff like the part about holding short, rather than just waiting to until after the other aircraft had gone to cross 36R or just crossing and hoping that it’s evident that I’m waiting for the other aircraft before I head off). After that aircraft had done it’s T&G, I lined up, took off and headed off to the northern part of the training area. During the climb to 4000ft, I got my phone out and took a few (rather bad quality) pictures. I’m thinking I might shove my camera in my bag next mission (when I’ll be off solo again) – but don’t worry, I keep a good lookout at all times! When I got to 4000ft, I decided to start with a few stalls. I did a mixture of clean power off stalls and a few power on stalls. I got a wing drop with the power on stalls, it seems far more likely to do a wing drop when I’m solo (presumably because all the weight is on one side). On one of the wing drops I seemed to end up going in a bit of a circle (I seemed to be turning as it dropped), which was slightly disconcerting at the time. Stalls definitelyseem more…exciting?…when you’re solo, that’s for sure! Then I did a few steep turns. I started off with a steep turn to the right which didn’t seem particularly successful, I didn’t get the G-force feeling so I don’t think I was banked far enough. I did a few turns to the left which were far more successful (I got the nice G-force feeling). Then I tried a few more turns to the right. On one of them I still didn’t have that G-force feeling but during the turn I glanced at the AH and, I’m sure I misread it, but it appeared to be showing 90 degrees of bank (!) which freaked me out so I quickly got out of that turn! Once again I was having problems today with maintaining my height, the aircraft kept climbing when I didn’t intend it to. Quite a few times I had to descend to make sure I didn’t got above 4500ft. I then tried a forced landing. When you’re doing it yourself, it’s very tempting to wait and pull the power in a spot where there’s lots of nice fields to choose from, so I tried to make sure I wasn’t doing that. The approach itself seemed to go fine and I think I would’ve made the field, so that’s all good. 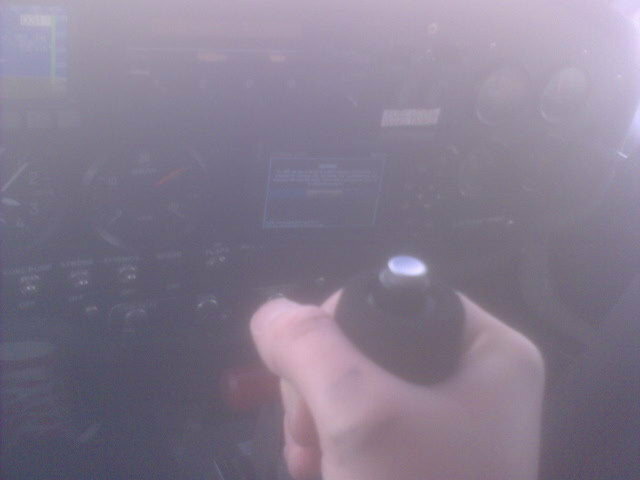 After that it was time to head back in, so I made my inbound call and joined crosswind. I flew the circuit and elected to do a flapless landing. As I had a small amount of spare time, I decided to make it a touch & go on 36L and do a second circuit to get a bit more landing practice in. The second time around I was planning to do a flapped approach but got distracted during my base turn when it banked more than I intended so I had to right that and after that I decided to just do another flapless landing. The landing itself wasn’t too bad but once again I was a bit higher than I thought I was, so it wasn’t as smooth as I expected. I seem to be misjudging the height a bit again since I’ve been going solo, I think that next mission I might come back slightly earlier and try and get a few circuits in to work on that. After today, I now have 4.8 hours PIC out of the minimum of 5 that I need to get the licence, so next mission will also be solo time so I can get the final 0.2 I need. I need a total of 10 hours PIC time to get my passenger endorsement once I get my licence so it doesn’t really matter if I do more now. After that it’s back to dual flying to brush up on everything and get me ready for my flight test (oooh!). I asked J about the theory exams I need to do – BAK, Human Factors and Radio (RT) – so in the next few weeks I’ll have to study for and sit all of those. This entry was posted on Sunday, May 2nd, 2010 at 9:58 pm and is filed under Certificate, Solo. You can follow any responses to this entry through the RSS 2.0 feed. You can leave a response, or trackback from your own site. Sounds like you had a fun morning. This first time I was out in the practice area I hated doing stalls because of the wing drop. I was sure I was going to end up in a spin for sure. On my checkride my examiner had me do a left steep turn and roll immediately into a right steep turn. It was something I had never done before with my instructor. When we did them I always had time to think in between the two turns before doing them. But that was the trend of my entire checkride. He moved me from one thing to the next without any wasted time in between. I guess there was less time for me to be nervous. From the time I got to the airport to the time I had my certificate in hand was an hour and a half. He didn’t leave anything out of the flight test but a very organized plan for doing the test. If you ever need some good tips for steep turns and some other stuff check out Greg Brown’s Flying Carpet Blog. He had a lot of great tips for flying and the checkride preparation.